The last comic of the New 52’s first week is a milestone of sorts. When DC launched its “edgy” imprint Vertigo in the 80s, Swamp Thing was a headline act among a crowd of mostly superheroes. 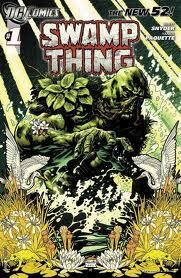 As the Vertigo line matured to offer a more diverse array of content, Swamp Thing remained a mainstay. I suspect that the Swamp Thing was re-integrated as a major core DC Universe player in one of the recent mega-crossovers, but with this new #1 he’s firmly established as part of the mainline continuity. Writer Scott Snyder makes this more or less immediately clear in a great three-page sequence that depicts a mass animal die-off from the perspective of three mainstream DC characters. Superman notices pigeons falling from the sky outside a Daily Planet staff meeting. Batman studies the corpse of a bat as others plunge to the ground beside the Bat Computer, and Aquaman is surrounded by dead fish somewhere in the sea. Cut to a newly resurrected Alec Holland, now working on a construction project after bitterly turning his back on his life’s work. In Swamp Thing’s original origin, Holland essentially died during a science experiment that resulted in his miracle plant growth formula leaking into the same bog that holds his fresh corpse, generating the Swamp Thing, a sort of nature elemental with control over plantlife. Whatever resurrected Alec Holland (in a big recent crossover I didn’t read) brought back the man, but not so much the weird swamp creature. None the less, creeping vines have a way of reaching out to touch Alec’s shoe, and in a later scene he awakens from a nightmare to find his motel room covered in lush plant life. Superman comes to visit Alec at the construction site, giving readers a much longer scene with the new “current” Superman than we’ve seen so far through Justice League (only a few panels at the end of the story) and Action Comics (which depicted a younger Superman shortly after his arrival in Metropolis four-and-a-half years ago. Paquette does a good job making Superman’s new “armor” costume look cool, and his drawings of the characters’ faces add realism to the scene. This is true throughout the book. Paquette’s illustrations, even of weird stuff like men twisting their own necks 180 degrees or animated bone creatures, roots everything in a real world, as opposed to one drawn in 4-color superheroic style. It’s a nice effect, and wholly appropriate for the tone Swamp Thing has been known for. It’s a good fit. I’m not so fond of the actual content of the conversation between Alec and Superman, which amounts to a pep talk from Superman, who’s worried about Alec’s frame of mind after returning from the dead. He speaks from experience, making me think that the legendary Superman: Doomsday and Death of Superman arcs from the 90s are in continuity in this version of the rebooted DCU. I do wonder, though, if they will also be retaining Superman’s mullet? Anyway, after Superman leaves we’re back to proper horror. Some evil presence is reanimating dead bones and making normal humans his neck-twisted zombie minions. Alec struggles with memories of his time as Swamp Thing, even though his appears fully human and claims not to remember anything since he fell into the swamp during his accident. Then, as the psychological trauma grows too high for Alec Holland, he wakes from fitful dreams and attempts to throw his recreation of his original biological agent into the swamp behind his motel. Only Swamp Thing stops him from doing so by making an appearance in the flesh. Scott Snyder’s script does an excellent job of introducing new readers to the character and giving a good overview of the main character’s personality, motivations, and origin with an emphasis on accessibility. While the story is more set-up than plot-driven, there’s enough there to keep the reader interested in finding out what happens next. This book accomplished everything it was supposed to and managed to tack on interesting art and good set-up as a bonus. That makes it one of the better comics of the week, and a certain survivor for at least several more issues. I just read this and issue #2 today, and thought both issues were pretty good: lots of allusions back to Alan Moore’s ST era—including Totleben’s Motel (1 and 2) and Wrightson’s Diner and Bissette Motors (both in issue 2). The cover for #1 is very reminiscent of the “Rites of Spring” issue from Moore’s era too, as are the “organic” panels in two-page spreads in both issues. The reverse-headed zombies are Invunche from Moore’s “American Gothic” storyline (they’re agents of the Brujería, all of which was tied back to the Crisis of the Infinite Earths, but I don’t know much more than that, since I didn’t read mainstream DC titles BITD).